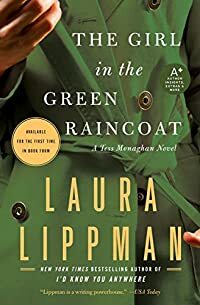 The Girl in the Green Raincoat by Laura Lippman, a Mysterious Review. Review: With an affectionate nod to Alfred Hitchcock's Rear Window (itself based on Cornell Woolrich's 1942 short story "It Had to Be Murder") — in fact, the film is mentioned early in the book as an activity, as in playing "Rear Window" — Baltimore private investigator Tess Monaghan, confined by her doctor to her home during the last month of her pregnancy, believes there is trouble afoot when a dog walker seems to go missing in The Girl in the Green Raincoat, originally serialized in the New York Times in 2008/2009 and now published as a novella, the 12th entry in this series by Laura Lippman. Bored with videos, books, and the bland diet she's on, Tess has taken to people watching. A woman in a green raincoat, walking a greyhound in a green jacket in a park across the way, catches her eye. She's there every day at the same time, except on Friday, Tess watches her arrive but later she sees the dog wandering around alone. The next day neither shows up. Concerned that something may have happened to her, she coerces her boyfriend, Crow, her best friend Whitney, and her office assistant, the delightful Mrs. Blossom, to do some leg work while she hits the Internet. They soon learn the woman has indeed disappeared, but there's no evidence to suggest it was anything other than of her own free will. It's a little surprising that more authors don't take advantage of the novella format. As The Girl in the Green Raincoat readily demonstrates, it's certainly possible to create a credible, well-plotted mystery with interesting characters that can be read in half the time, something many readers no doubt appreciate now and again. To be sure, the storyline is a understandably a little thin here and there; the limited page count doesn't really allow for the introduction of multiple suspects, the pursuit of false leads, or the emergence of fully developed red herrings. There are, however, a few seemingly unrelated, though brief, plot tangents and more than a little space is devoted to the state of her pregnancy and what it will mean to her, personally and professionally, after the baby is born. Still, The Girl in the Green Raincoat is quite satisfactory as a simply presented, ostensibly familiar whodunit that plays out in an unexpected manner. Acknowledgment: HarperCollins provided a copy of The Girl in the Green Raincoat for this review. Location(s) referenced in The Girl in the Green Raincoat: Baltimore, Maryland.